In American scientization of politics culture, evolution acceptance is a big deal, as is climate change. Yet other science acceptance issues get much less attention. Why? Evolution and climate change are not the most pressing short-term science issues we face, food, energy and medicine are. 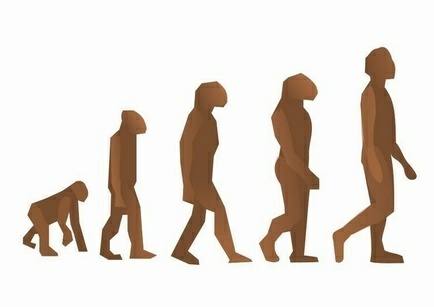 I am in awe of evolution but no one dies if some crank school district wants to put religion side-by-side with biology in a classroom, and American CO2 emissions from energy, obviously our biggest polluter, are back at early 1990s levels, thanks to science finding ways to make natural gas extraction better. Some biologists worry more about food and medicine while some worry more about evolution education in schools. The reason may be as simple as the politics of academia versus the politics of private sector biologists. Government-funded life sciences academics vote 84% Democrat, and they can shroud their decision in a cloak of reason if they make political choice solely about evolution: because more Republicans deny evolution, Republicans are anti-science and we can't vote for them. Republicans don't believe this graphic. Neither do scientists. Because it's wrong. Yet Republicans get criticized for believing it slightly less than Democrats while all those anti-vaccine, anti-GMO and anti-energy Democrats get explained away. It's a fine narrative, it just takes ignoring inconvenient truths, like that the difference between Democrats and Republicans is only 9 percent on that topic, and that in areas other than evolution and climate change, Democrats are much farther from the science consensus than Republicans are - of 55 politicians in Congress who wanted to put warning labels on GMOs, 53 were Democrats. That is real anti-science belief that correlates with a political party. The most anti-vaccine hotbeds of the most anti-vaccine state, California, are all 80 percent Democratic so that also correlates to political party if evolution and global warming belief does. Compared to those levels of anti-science thinking, evolution is doing quite well. A new pair of surveys by the Pew Research Center in collaboration with the American Association for the Advancement of Science (AAAS) finds that evolution acceptance, at 65% of the public, is nearly twice that of acceptance of other well-established biology, such as genetic modification of food, where only 37% of people think it is safe, or pesticides, where only 28% think it is safe, despite the consensus of science and all regulatory bodies. The people that are against agricultural science (and vaccines and energy) are overwhelmingly Democrats. Scientists understand that genetic modification has been done by humans for 10,000 years and by nature long before that - random mutation, though completely natural, can be dangerous, even if it is a part of evolution. Whole Foods shoppers may believe that mutagenesis, the less-precise genetic modification done before GMOs that has resulted in 2,000 strains of food - including many organic foods - is natural while modern GMOs are not, but scientists know that calling one a GMO and one not is just an arbitrary legal definition that has nothing to do with science. Scientists certainly know that dousing crops with organic Bt spray is not healthier than a Bt gene - or a synthetic pesticide. Evolution and climate change still get plenty of traction among the demographic that needs to promote their notion of superiority over conservatives - it rationalizes why conservatives can't seem to get tenure jobs in academia - but if we really cared about science and the public, and not just putting one over on the other party, we'd stop fighting a fake culture war about evolution and the right wing and take a more honest look at all the people on the left promoting anti-science ideas about food, energy and medicine.